Lay It On The Line: The Casey Combest Story. 0:00-0:37 you could see how much passion he had for sprinting and how becoming successful or at least trying his very best to become an elite sprinter meant the world to him. Disappointing that his comeback was shortlived but at least he gave it a legit shot. He didn't grow up in the greatest environment, so he never really had the chance to show how far he could get. disagree.. he had a chance to fly right out of the hood into stardom, but he himself blew it (unfortunately). he didn't love it enough, which is understandable, it came easy for him..
His dad was a pretty good sprinter as well being a two-time state champion quarter-miler. 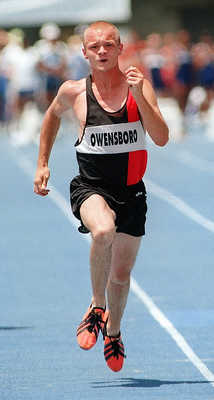 "Keith Combest, a 48.4 400 runner in high school in the mid-1970s, has high hopes for his son". Just goes to show how important genetics are. 1 of the guys I ran against earlier in the year went to World Junior Champs for 400m when he was younger and has a 400m PB of 47.04 done when he was 19. Anyway getting back to Combest here's a couple more pictures from his high school days.